Revealed on September 30th as part of the 2016 Force Friday event, Entertainment Earth's exclusive The Black Series 2016 Entertainment Earth Exclusive Clone Trooper Four Pack offered collectors of The Black Series 6-Inch line four debut Phase II Clone Trooper figures. the set is slated for a November release. 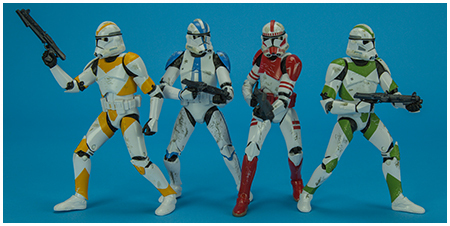 These clone troopers served with Jedi Master Obi-Wan Kenobi in the Grand Army of the Republic's 212th Attack Battalion during the Clone Wars. An elite unit of clone troopers, the 501st Legion patrolled the grounds after their siege of the Jedi Temple on Coruscant. Equipped with AT-RT walkers and ISP speeders with green markings, and skilled in besieging enemy fortifications, the 442nd Siege Battalion was a unit of clone troopers within the Grand Army of the Republic during the Clone Wars.